Want your favourite pair to last for ages... then don't wear them every day! Be gentle with them and don't yank them up by the belt loops. Denim is a very special fabric and over time it's likely to fade and stretch, which gives it that character we love. Your fabulous new jeans don't need to be washed after every wear. To keep them looking and feeling good, use a damp cloth to remove small stains. If your jeans need a freshen up, seal them in a plastic bag and pop them in the freezer overnight (don't forget to give it time to defrost). Doing this will preserve the shape of your jeans and remove odors. Beware of colour transfer while your jeans are new, dark denim can make it's mark on shoes and light garments. When you wash them, be sure to wash them with similar colours to prevent any unnecessary fading or colour transfer. 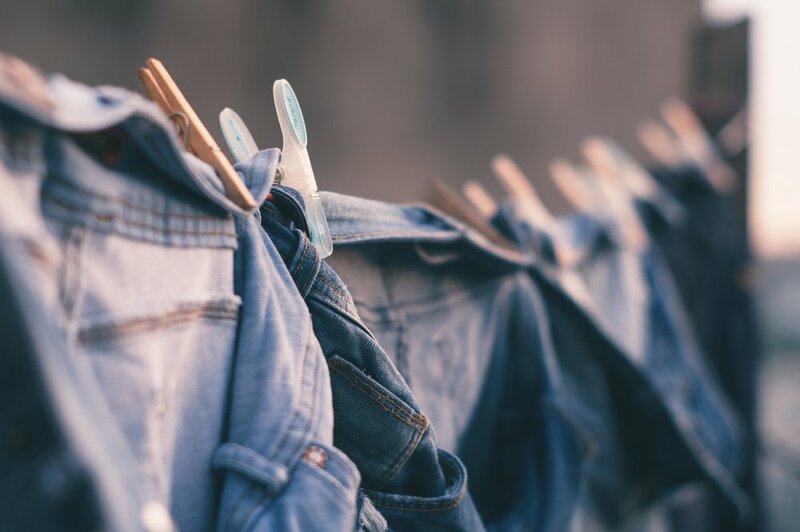 Turn your jeans inside out and wash seperately to prevent excessive colour loss - a good fade comes from living in your jeans and not an aggressive spin cycle! Try to get them out of the machine as soon as they finish and give them a good shake. Dryers are the equivalent of the kyrptonite for jeans, instead opt for a breezier option. Hanging them to dry preserves the fit and avoids possible shrinkage or fabric warping. You should also keep them turned inside out (and out of the sun) to prevent fading while ensuring the inside pockets will dry. Harsh soaps are not your friend, hold onto that colour by using a cold-water detergent. Many detergents are concentrated, so you don't need much and always use the cold water spin cycle to protect against fading and shrinking.